Welcome to the Bigfoot and Tiki show comic launch, I’m super glad that you’re here! This week there will be a new comic Monday through Friday as we get things cooking and discover the origin of this oddest of couples. I hope you enjoy it! 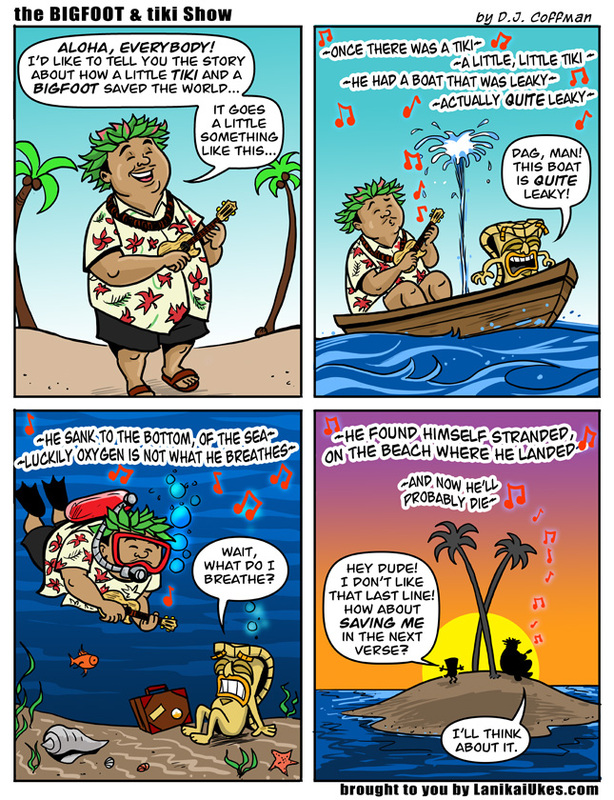 I’d also like to encourage you to join our free newsletter “UKE CLUB” where I will occasionally send some bonus comics and goodies to our “super fans” – Also, thanks to our amazing sponsor, Lanikai Ukulele, they’ve offered to give away a brand spanking new Banjolele to one lucky random email address on the list at the end of August! Subscribe for free now! Love the crisp, clean style. The comic looks nice! I love the colors and overall art style.